Challenges associated with traditional integration needs have compelled the adoption of Integration Platform as a Service (IPaaS) approach, which is a viable alternative to deliver integration stacks. Complex tasks such as integrating hybrid application portfolios with conventional data systems are being effectively carried out by IPaaS solutions. Transparency Market Research anticipates that in the near future, the adoption of IPaaS will surge vigorously, particularly owing to the capabilities of these services in routing & orchestration of complex dataflow and providing easy implementation of API, applications and processes for subscribers. According to the recently developed market study, the global IPaaS market is anticipated to be worth over US$ 1.2 billion by 2022-end. Over the next five years, the global IPaaS market is pegged to expand at a robust CAGR. The report has highlighted several factors that are expected to influence the dynamics of global IPaaS market during the forecast period. 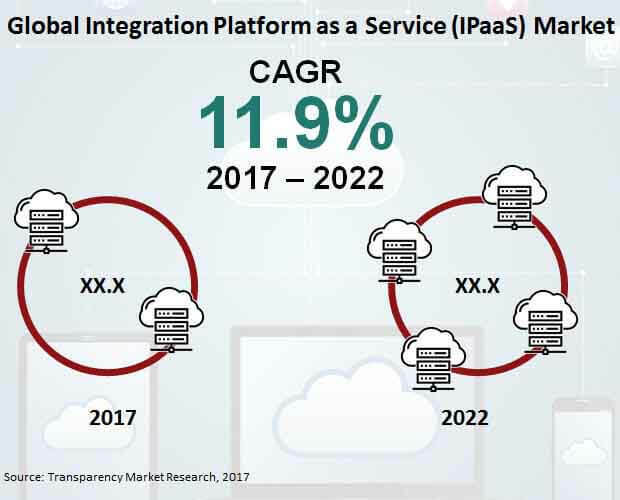 Increasing demand for cloud-based integration, rising implementation of service-oriented business architecture, and operational importance of executing integration flows among contrasting applications, are among the key factors addressed in the report as growth drivers for the global IPaaS market. Key components of IPaaS solutions include either the service provided for integration tasks, or the software platforms developed to carry out these tasks. In 2017, a major share of revenues procured in the global IPaaS market are anticipated to come from sales of software platforms. However, over the forecast period, the end-users of IPaaS solutions will be shifting their focus from using a software platform to adopting a service. Implementation issues associated with IPaaS software platforms are being viewed to decelerate their revenue procurement traction in the global market over the forecast period. By the end of 2022, IPaaS software platforms will procure largest share as a component in the global IPaaS market. Although, the adoption of IPaaS services will be considerably rapid, and is anticipated to register a stellar 12.8% CAGR throughout the forecast period. The report projects that large enterprises will remain key end-users of IPaaS during the forecast period. Compared to small & medium enterprises, multinational corporations and manufacturing giants are estimated to actively adopt IPaaS solutions and integrate complex operations to enhance their overall productivity. In 2017, close to three-fourth share of revenues procured in the global IPaaS market are anticipated to be accounted by their end-use among large enterprises across the globe. On the other hand, constraints associated with expenditure on integration solutions will continue to lower the adoption of IPaaS among SMEs. According to the report, the global IPaaS market will showcase considerable traction in terms of adoption across education and healthcare verticals. While the adoption of IPaaS will be predominant in the IT & telecommunications industry, participants in the healthcare and education sectors will also show increased interests towards integration solutions. Hospitals and healthcare service providers are likely to adopt IPaaS for integration of documentation processes and supplies management. Pharmaceutical companies are expected to implement IPaaS for consolidating their manufacturing with drug development operations. For the education industry, IPaaS will enable schools to streamline and organize their daily operations, and control the access to information and data through integrated platforms. The report has also profiled key players in the global IPaaS market. Companies namely, IBM Corporation, MuleSoft, Inc., Oracle Corporation, Fujitsu Ltd., Red Hat, Inc., SAP SE, Microsoft Corp., Capgemini SE, TIBCO Software Inc., and Dell Inc. are anticipated to remain active in the expansion of global IPaaS market through 2022. Several IPaaS providers will be focusing on eliminating the implementation drawbacks and lowering the additional service requirements by developing custom-made offerings. The key advantage of availing this document is to comprehend the segmented analysis of global IPaaS market provided across a slew of distinct chapters. These chapters offer cross-segmental information and country-specific market forecast & analysis. The report has categorised the global IPaaS market into four key segments – component, end-user, industry and region. On the basis of components, the global IPaaS market is bifurcated into software platforms and services. Similarly, large enterprises and small & medium enterprises are segmented as key end-users of IPaaS in the global market. The report further segments the global IPaaS market across industries namely, BFSI, IT & telecommunication, government, healthcare, education, and others. A regional analysis provided in the report has segmented the global IPaaS market into North America, Europe, Asia-Pacific excluding Japan (APEJ), Middle East & Africa (MEA), Japan, and Latin America.